Located in Pennsylvania between the Delaware and Schuylkill Rivers, the city of Philadelphia was founded in 1682 as a Quaker settlement by William Penn. It later became became a city in 1701 and was laid out in a grid of rectangles, making it the first planned city in America. Its name is taken from the Greek for "city of brotherly love" and it is steeped in the history of the United States. Philadelphia is now currently one of the nation's most important centers for business, medicine, education, and culture. Philadelphia attracted many immigrants and settlers and eventually became the financial capital of the colonies, as well as a major port city and a center of science. It also became the political center of the 13 colonies' rebellion during the Revolutionary War and the meeting place of the First Continental Congress in 1774. The Second Continental Congress met in the Pennsylvania State House from 1775 to 1783, and it was here that delegates signed the Declaration of Independence on July 4, 1776. Now known as Independence Hall, the Pennsylvania State House was also the place of the drafting of the Articles of Confederation, and the Constitutional Convention drafted a guiding blueprint for the nation's federal government here. Philadelphia City Government - official City of Philadelphia website. 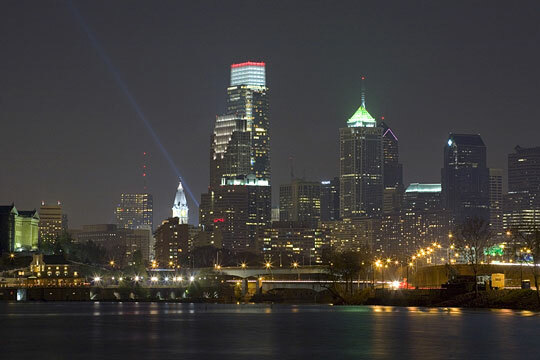 Philadelphia Weather and News - current weather in, and recent news about, Philadelphia. Philadelphia Product and Service Guide - Philadelphia enterprises. Philadelphia Schools - Philadelphia area educational institutions. In-depth Philadelphia information and news can be found on these regional Philadelphia Libraries and Philadelphia Newspapers pages, respectively. Visitors to Philadelphia will find this Philadelphia Travel and Tourism website useful.